This summer, thousands of Catholics from Orange County and beyond, responding to invitations sent out in English, Spanish, and Vietnamese, packed a sun-drenched plaza in Garden Grove. They were there for one of the most important, and overlooked, religious events of the year: the inaugural Catholic Mass at the Crystal Cathedral, once the very epitome of showy, sunny Southern California Protestant Christianity. The event marked not only the rebirth of the Crystal Cathedral—but also the total reversal of everything I once thought I knew about L.A.’s spiritual landscape. And as a reporter covering religion, I thought I knew at least something. 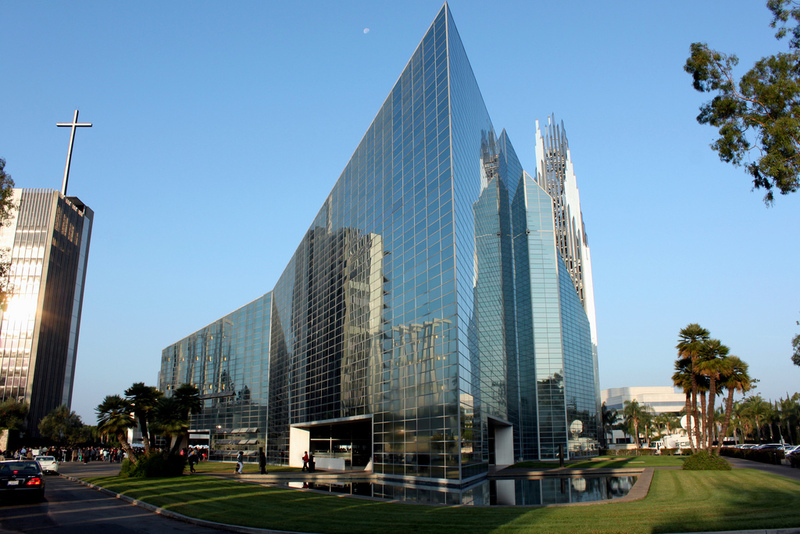 Last year, after declaring bankruptcy, Robert H. Schuller’s Crystal Cathedral Ministries sold its signature glass church to Orange County’s Catholic diocese, one of the nation’s largest and fastest growing. The diocese, whose 1.3 million Catholics comprise more than 40 percent of Orange County’s entire population, promptly announced plans to rename the church “Christ Cathedral” and transform it into a Catholic worship space and cultural hub with a year-round schedule of concerts, lectures, and art exhibitions. The Crystal Cathedral, long mocked as being neither a cathedral nor made of crystal, would become real at last, with a consecrated altar, baptismal font, and Catholic iconography to replace the elaborate stagecraft of Schuller’s worldwide television ministry, which included lavish Easter and Christmas pageants with flying angels and live animals. The bankruptcy of Schuller’s church wasn’t just another spectacular televangelist flameout. The Crystal Cathedral’s demise was a symptom of a wider decline in American evangelical Christianity that has been quietly gathering speed for the last decade and, at last, is being noticed outside church circles. When Schuller began his Southern California ministry in the 1950s, he famously preached to worshippers in their cars from the snack bar rooftop of a Garden Grove drive-in movie theater. At the time, Schuller was lauded as a visionary for leading Christianity into America’s suburban future. He reaped the rewards of his prescience, building a church empire with thousands of Southern California worshippers, an ecclesiastical compound larded with architectural monuments (the Crystal Cathedral campus includes noteworthy buildings by Philip Johnson, Richard Neutra, and Pritzker Prize winner Richard Meier) and a television ministry with millions of viewers on nearly every continent of the globe. As it turned out, Schuller’s gaze into the future of American Christianity only reached so far. Demographic changes began nibbling at his congregation as early as the 1980s, when waves of Vietnamese refugees settled in Orange County, and a go-go housing industry imported thousands of migrant Mexicans to build master-planned subdivisions. Soon the aging neighborhoods surrounding the Crystal Cathedral were unrecognizable from Schuller’s drive-in movie days. Today, more than three-quarters of the roughly 1 million residents living in Orange County’s central core—the cities of Garden Grove, Westminster, Anaheim, and Santa Ana—are non-white, according to the U.S. Census. Little Saigon, the area’s Vietnamese community, is home to the world’s largest population of Vietnamese outside Vietnam. In Santa Ana, 80 percent of residents speak a language other than English at home, mostly Spanish. These newcomers might have settled close to Schuller’s church, but they didn’t go there. Their parents and grandparents were Catholics or Buddhists in their home countries, and most of them stayed that way. That explains the rebirth at the Crystal Cathedral—and the opportunity it represents. Since 1976, when Orange County Catholics were split from Los Angeles into their own diocese, the Catholic presence in the county has steadily grown from less than one-fifth of the population to nearly half, according to church statistics. The diocese doesn’t track the ethnicity of members. But a church spokesman told me that roughly three-quarters of parishes in the diocese celebrate at least one Mass in Spanish. A quarter celebrate Mass in Vietnamese. Last year, the diocese installed a bishop who speaks fluent Spanish and passable Vietnamese. The failure of Schuller’s church to keep up with Southern California’s ethnic transformation is now being writ large across America. As the nation’s demographics move closer toward L.A.’s, American evangelicals find themselves suddenly and uncharacteristically in decline. After decades of growth, the Southern Baptist Convention, America’s largest evangelical denomination, began losing members 10 years ago, with the pace of decline accelerating each year. In the most recent Pew Research Center survey of America’s religious attitudes, the number of white evangelical Protestants reached a new low (19 percent), and for the first time was surpassed by the number of Americans claiming no religious affiliation at all. Evangelical mega-churches like Saddleback Church in Orange County have seen their once explosive growth plateau and, in some cases, reverse. Younger evangelicals tell pollsters they are leaving the faith because they’re tired of its public hostility to homosexuality and its focus on corporate-style growth. Meanwhile, the fastest growing faith in America today is Islam, with roughly 2.5 million adherents in the U.S., one-fifth of them in Southern California, according to Shakeel Syed, executive director of the Shura Council of Southern California, a Muslim umbrella organization. We are now home to one of America’s largest mosques, just a few miles from the Crystal Cathedral in Garden Grove, and some of the nation’s youngest, most progressive imams, who refer to rap lyrics in their sermons and are forging links with local Christian pastors. Thirty-year-old Jamaal Diwan, who leads the rapidly growing Islamic Center of Irvine (up to 6,000 attending Friday prayer services), works with local Christians on a regional interfaith council, plays basketball with his mosque’s 200-member youth group, and regularly speaks at Muslim student club meetings in Irvine high schools. The only major variety of Christianity currently growing in America is Pentecostalism, an international movement expanding even more rapidly in Africa, South America, and other parts of the developing world. This year, leading evangelicals made headlines by reversing their earlier position and vocally backing comprehensive immigration reform—a belated attempt to respond to the same demographic changes that helped undo the Crystal Cathedral. It’s one thing to read the poll numbers documenting these changes. It’s quite another to experience the changes firsthand. I was an Orange County religion reporter early in my career as a journalist. I took a long break from the beat, first to cover Governor Arnold Schwarzenegger in Sacramento (definitely not a religious experience), then to move to New York when my wife—who’s an Episcopal priest—got a job at a large church in Manhattan. We moved back to California two years ago (Kate’s job again) and I resumed writing about religion, which truly is my favorite beat. As a clergy spouse I’m never out of touch with spiritual issues. But I was totally unprepared for what I found as I began delving back into religion in California. When I left the beat in 2003, Catholics were on the ropes (on the verge of paying $100 million in Orange County to settle claims of priest sexual abuse) and evangelicals were ascendant (poised to reelect George W. Bush and outlaw gay marriage in 11 states). Now everything is reversed. The lesson I draw from the death and rebirth of the Crystal Cathedral is that patterns of religious worship in a nation as dynamic and unstable as America are never as immutable as they seem at any given moment. Change can be unsettling for many people of faith, who turn to God for stability and comfort. But change can be good, too. Southern California was once a spawning ground for wacky, flaky religious fads of every kind. These days, it’s pioneering a multiethnic religiosity unburdened by blind triumphalism and closely linked to the world’s vast array of religious expression. The Crystal Cathedral is dead. Long live Christ Cathedral. Jim Hinch is a religion correspondent for the Orange County Register. Catholicism, demographics, Orange County, religion, Thinking L.A.